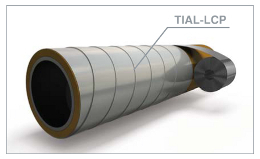 TIAL - LCP is a heat-shrinkable tape designed for protection of pre-insulated exposed pipes. Coating of straight pipes, bends and fittings is performed by spiral winding in field conditions. Pre-insulation of pipes can be provided with PU foam, mineral cotton and other heat-insulating materials and then with TIAL-LCP tapes for waterproofing. TIAL-LCP provides long lasting and effective protection of heat insulation layer against water, UV-radiation, and other external factors. Unique property of TIAL-LCP is fire-resistance. This property allows to greatly minimize damage caused by burning dried grass or in case of incendiary crime. For good-looking appearance of above-ground district heating pipes TIAL provides customers with TIAL-LCP of various colors (silver, green, blue, red and yellow). Coating works can be performed by application crews of 2 or 3 workers depending on the pipeline diameter. Protective properties of TIAL-LCP are preserved at temperatures from - 60 °C to +60 °C. Lifetime of TIAL-LCP is minimum 30 years.